Sister's Cabin, located on the shore of Lake Superior in Lutsen, is a tranquil, homey cabin just minutes from hiking trails, skiing, boating, kayaking, golfing, biking and more. 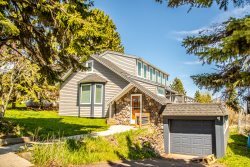 Located on the popular Cascade Beach Road and sitting just feet away from Lake Superior, this is a North Shore gem. Sisters Cabin is a cozy 3 bedroom, 2 bathroom vacation rental home in Lutsen, MN on Cascade Beach Road Located just a short 30 foot walk to the shoreline area, Sister`s Cabin offers amazing views with ample amounts of privacy. You can enjoy 250 feet of private ledge rock beach during your stay. Enjoy sunrises and seasonal sunsets from your private beach area. Walk into the main entrance of the home, take off your shoes, and know you are home. Floor to ceiling windows and the arched ceilings make this living room feel bright, spacious, and inviting. Enjoy the eclectic mix of comfortable seating in the living room. A small TV provides entertainment, or open the deck door for the real entertainment- Lake Superior The wood fireplace is great to warm up the living room on cold nights. The open concept allows the living room to flow easily into the dining room and kitchen. There is seating for four at the dining room table. The full size kitchen is well equipped for your baking needs. Enjoy preparing a home cooked meal while never missing a moment with family and friends. The main floor master bedroom features a queen size bed and attached, but shared, bathroom. Unpack and relax in this comfy master bedroom. Upstairs in the loft area you will find two guest bedrooms- the first with two twin beds. Plenty of room to unpack and relax in the first guest bedroom. The second guest bedroom has a full size bed. Also plenty of space to relax Between the two guest bedrooms is the loft area, filled with games and activities. This space is great for older kids. This view is looking toward guest bedroom 1. And this view is looking toward guest bedroom 2. Looking down from the loft area, you can really appreciate those floor to ceiling windows and the amazing Lake Superior view. The unique bathroom is divided into two parts. The toilet and vanity are accessible off of the hallway and connected to the second section. The second section features a full bathroom with a shower/tub combo, accessible through the attached half bath and the attached master bedroom on the other side. Coming for an extended stay, take advantage of the washer and dryer available at Sister`s Cabin. Located off of the living room, the lake-facing deck is great for enjoying the incredible Lake Superior views. Grab a book and a cup of coffee and relax to the sound of the waves lapping against the Lake Superior shoreline. Sister`s Cabin is a quaint and cozy home that you can call yours during your next North Shore vacation. Enjoy the deck and close proximity with easy access to Lake Superior. Stroll down the path to your 250 feet of private ledgerock shoreline. The ledgerock shoreline, looking east, is great for enjoying the sunrise year round. Looking west, you can catch the sun set most of the year. Find a comfy rock, sit down, and just enjoy this beautiful location on Lake Superior. Hillside Harbor is a bright, clean home in Grand Marais, MN. Come on "home" to Sister's Cabin. Relax and enjoy your vacation in this tranquil cabin located on the ever popular Cascade Beach Road in Lutsen, nestled on a beautifully wooded 1.2 acres of land and 250' of ledge rock shoreline. The deck boasts a 4-mile view of Lake Superior. If you are headed north to enjoy the beauty that is the Great Lake, look no further! Sister's Cabin is cozy, yet spacious so you will feel at home the instant you walk in the front door. With 3 bedrooms (two upstairs and one downstairs) and 1.5 bathrooms (both downstairs) there is plenty of room for up to 6 guests. The downstairs living area is open and inviting with a well-equipped full-size kitchen, dining room with seating for four, and living room with plenty of seating for everyone and a wood-burning fireplace to keep you warm on cold winter nights. Upstairs there is a fun loft space located between the two bedrooms with games and activities that everyone can enjoy. You may be tempted to never leave during your stay, but should you be on the hunt for a great outdoor adventure you've come to the right place! The Lutsen area offers everything from miles of hiking and biking trails to the midwest's premiere downhill skiing destination, Lutsen Mountains. Head up during the summer months, as well, to enjoy the alpine slide and take a scenic gondola ride up the Moose Mountain Summit where you can enjoy breathtaking views of Lake Superior. Cascade State Park is just a couple of miles away and features a gorgeous waterfall after a short, easy hike. You are also just a short drive away from several restaurants (some only open in the summer months) and quaint, locally-owned shops. So sit on the lake-facing deck and relax with a good book and the sound of the Lake Superior waves in the background, or head on out and explore everything that the beautiful North Shore has to offer. Whatever your vacation goals are, Sister's Cabin has it. * Sister's Cabin has an iron spiral staircase and high decks that may not be suitable for children under 5 or those with mobility issues. Includes additional half bath attachment (commode and sink) Full bath is accessed from master bedroom or thru adjoining door to half bath. Half bath is accessed from hallway. We have always had a great experience with Cascade Vacation Rentals, no issues whatsoever. Sisters Cabin is a great place to stay. Very cozy with great views of the lake. internet communication was very good. Received all the info we needed in plenty of time. It was the perfect location for us. View and access to lake was great! We found everything we needed for cooking and had good access to wifi. I never interacted with any members, it was all done through the website. Overall location was great with fairly quick trips to many points of interest in the area, including Grand Marais. The main living space (living/dining/kitchen) was open and worked well w/ our group. There was no patio furniture (patio table/chairs) for the group to sit outside on the deck overlooking the lake and enjoy meals. The 2 upstairs bedrooms, the bedding situation wasn't ideal for adult couples. I always rely on Tami. She is terrific. We love the cabin and will return again in the fall, but some amenities fall short. For cooking, a mixing bowl or two would be helpful as well as a spatula. Kindling would be nice if anyone wants a fireplace fire. And I know it is a lot to ask for, but a new stove with level burners that heat consistently would sure be nice. Great location, great views of Lake Superior. Very nice place to stay. One of the best we have stayed in for CVR. The electronic process was good. I dont remember if I actually talked to anyone. The Sisters Cabin was a beautiful retreat. The rocky shoreline was very accessible and offered incredible views with big rocks for grabbing some sun or using the fire pit. The house is also in a handy location to go north or south for great restaurants and hiking. Were coming back! We stayed at Sisters Cabin and have rented it many times. Its all about location and proximity to the lake. The master bedroom is very sweet given the lake exposure. We dont care for the fu4nishings, theyre very worn and uncomfortable. The shower head leaked and lots of condition issues but still worth the stay there. We loved this property. The character and location were exactly what we were looking for. Great spot, fantastic view of the lake, very close to Lutsen Mountains. They were great when I screwed up and thought my reservation was for one day longer than it really was. Great location and great service from Cascade Vacation Rentals. Only negative is the stove---electric with burners that are not level and which heat very unevenly. Minor issue is no fire starters or kindling, even though there is a note with the firewood about how t use the fire starters, We have stayed there before so I simply brought my own. If you plan on fires, bring some. Great location being just a little north of Lutsen gave us quick access to parks and trails that we don't always get to as well as a fun day in Grand Marais. While in Grand Marais I kept thinking we will stay in town next time but then after retreating to our quiet cabin in the woods, I definitely plan on staying here again! We had a great stay at Two Sisters Cabin. The cabin was clean, cozy and filled with charm. Great collection of books and games. The views were beautiful and our daughter had a blast exploring the rocky shoreline (especially when the water was calm) and making smores over the bonfire we built on the rocks. Cabin is in a great location near Lutsen and Grand Marais. Great relaxing vacation, we definitely hope to return! A beautiful view of Lake Superior complemented by 5 sunny yet cool days gave us the last blast of winter we were looking for. The Sisters Cabin gave our family of four the space that was needed to have a great time and that was especially complemented again by allowing the rest of the family to be with us...our two dogs. Morning walks with them on Cascade Beach Road were a real highlight for me/us. Thanks to all at CVR and your owners for making trips like this possible! It was our last official spring break with our seniors in college daughters and though we never left the state, it will be fondly remembered by all of us for many many years. Thank you! Great location right on the lake. Very close to the ski hill. Liked the fireplace and the ample wood supply. The only thing missing is a hot tub or sauna - but we knew that when we made the reservation. We liked the look of the cabin when booking that we decided to skip the hot tub and stay here. Great place!!! We had a wonderful time up at my sister's cabin! Beautiful home with everything you could need and amazing views of Lake Superior.... There was a storm rolling in and the waves looked as if they were crashing right into our laps we were so close to the water... powerful, beautiful. We saw the sun rise and set. Our dogs loved lying on the floor by the fireplace and looking out the deck doors at the Lake (and so did we!) We will be back! Thank you! Wonderful home. Felt like we were family guests. Perfect setting on Lake Superior. Minutes from trails, towns & adventure. Lockbox check in & express checkout simple and appreciated. Next time we will plan a longer visit. Thanks Cascade ! Great location, and nice cabin. King sized bed is a real plus, and bed height lets you see the lake from bed. The home was very comfortable and nicely furnished. The kitchen was well-equipped. We loved the great collection of books. The home felt warm and cozy, yet offered enough space and quiet corners to allow us individual privacy. We found the facility clean and well maintained upon check in. Our only negative comment with the property was the spiral staircase--using it required a little extra care (at least for two of us 50+ year-old guests). Conveniently located near Grand Marais and State Parks. Sisters Cabin provided a fantastic vacation home! Loved the home and location with respect to both the lake and local activities. The spiral staircase was a bit of a challenge but overall a beautiful cabin. Would love a later check out time! The Sister's Cabin was perfect for our family! Beautiful location right on the lake, great floor plan, warm & inviting. It felt like home.